This 39 minute documentary, made in Bengali, shows the people of Lalgarh in action–cutting down trees to block the police and paramilitaries from using the roads, and confronting the security forces at every turn. It also has interviews with members of the People’s Committee against Police Atrocities. This article was published on Democracy and Class Struggle. We all know how good our police is in making stories and killing innocents in the name of encounter. 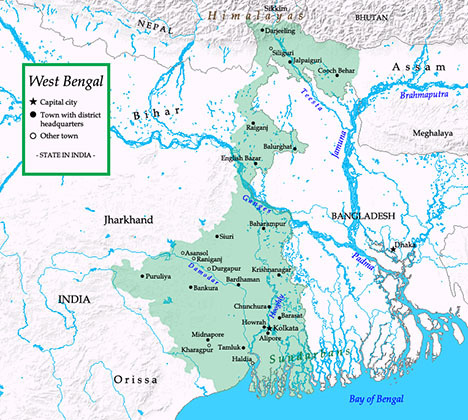 The West Bengal Police is no exception. There was no exchange of fire at Kantapahari as claimed by police. The fact is that the Joint security forces entered the house of Sri Lalmohan Tudu, President PCPA (People’s Committee against Police Atrocities) around 11hrs in night, while he was preparing to go to bed. KATHMANDU, Feb 25 – The High Level Political Mechanism (HLPM) meeting on Thursday decided to resolve all the issues of contention including the power sharing in a “package deal”. However, the meeting could not settle the row over the joint resolution motion, which apparently is the cause of disagreement and is responsible in protracting the deadlock. The meeting held at the residence of Nepali Congress (NC) President Girija Prasad Koirala in Maharajgunj this evening failed to forge consensus as the Maoists and the Nepali Congress (NC) stuck to their respective stances. The Maoists have been demanding for the change in government leadership, while the NC is against defaming President Dr. Yadav at any cost. 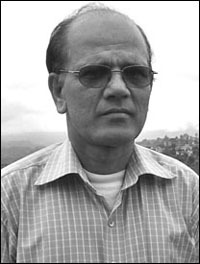 Following internal dispute, the Unified CPN (Maoist) has decided not to expand the central committee for the time being. A meeting of the central committee held at the party headquarters in Paris Danda, Koteshwor, on Thursday took this decision. According to leaders, the meeting arrived at the decision that there was no need to extend the central committee for now. While speaking during the meeting, most of the leaders emphasised that strengthening the party organisation was more important than inducting new members in the central committee. There was dispute in the party after different state committees and affiliate organisations recommended as many as 500 names to be inducted in the central committee, which was to be enlarged to 175 from the existing 137. Some reports said the party leadership was preparing to extend the central committee to 250, making it the largest leadership body of any political party in South Asia. Earlier, the party’s standing committee and the politburo had endorsed the proposal to enlarge the central committee. This article appeared on India Blooms on February 24, 201o. New Delhi: Union Home Minister P Chidambaram on Wednesday questioned the seriousness of the Maoists in holding talks while reiterating that the rebels must abjure violence if they are indeed for peace. 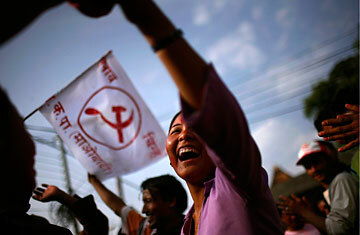 “All I want the Maoists to say are four words: We will abjure violence. I have said this earlier also,” said Chidambaram reacting to a question at the NDTV Indian of the Year function when told that a “courtship” has unfolded over exchange of phone numbers with the Maoists after rebel leader Kishenji provided a phone number to the Home Ministry for holding talks after the ministry gave them a fax number. He said he told the Maoists that if they abjured violence then he would get back within 72 hours after speaking to the Prime Minister and other concerned like the chief ministers of eastern states. 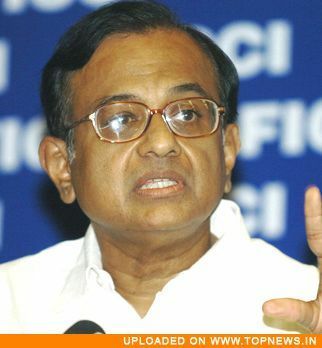 ”Three hours after their statement (of ceasefire) they attacked a joint patrol party (in West Bengal’s Katapahari),” Chidambaram said questioning the sincerity of the rebels in holding talks in an atmosphere of peace. 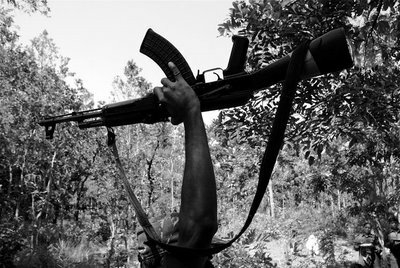 The Maoists made a ceasefire offer but followed it up by an attack at the Katapahari CRPF camp in West Midnapore district. Maoist-backed People’s Committee Against Police Atrocities (PCPA) president Lalmohan Tudu was killed in the encounter along with two others, police claimed. The police force, with their morale down since the Silda camp attack that left 24 jawans dead, on Tuesday tasted a semblance of success after the Katapahari camp attack was foiled and Tudu killed. 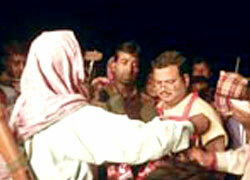 On Tuesday, the Maoists gave a mobile number to the Union Home Ministry to call them for talks. Maoist leader Kishenji told the media the home ministry’s representative could call them on the mobile number 9734695789 after 5pm on Thursday, Feb 25. New Delhi: An aide of top Maoist leader Kishenji today dismissed the offer of talks by Home Minister P Chidambaram to naxals as a “drama”, saying he doesn’t want to talk but to control and dominate the people who are talking about their rights. On the telephone number given to them by the Home Ministry to fax their proposal, he said, “he (Chidambaram) has laid many traps. This is Chidambaram’s ‘natak’ (drama). “”Chidambaram’s offer is of 72 hours. He really doesn’t want to talk. He wants to control and dominate the people of jangalmahal here who are talking about their rights and he wants to silence them,” Raju, an aide of Kishenji, told NDTV. “We are willing to ceasefire for 72 days, not just 72 hours if state terror stops,” he said. This article appeared in the Washington Post on February 23, 2010. This is a very significant (and politically astute) offer. 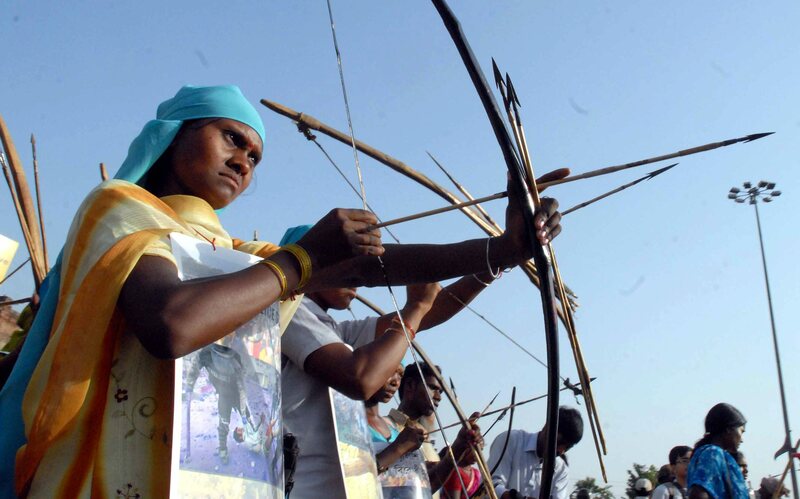 Singh and Chidambaram will have a hard time rejectiing this peace initiative by the Maoists. The terms are simple–both sides stop military operations in order to begin negotiations. 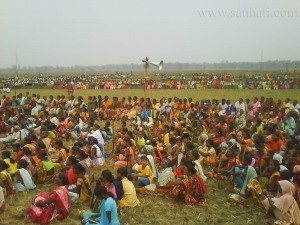 The CPI (Maoist) has stated that stopping all mining operations and tearing up the MoUs in the adivasi areas, and releasing villagers accused of Maoist ties during Operation Green Hunt are at the top of their negotiating agenda. The Maoists are also making an attempt to reach out to liberal intellectuals and human rights groups who have generally opposed military actions by both the government and the Maoists while exposing the government’s human rights abuses. 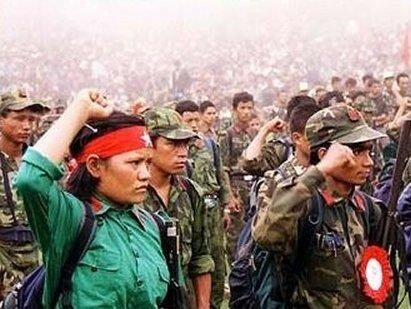 The Maoists have also timed the 72 day cease fire period to expire on May 7, around the time of the arrival of the monsoons, which makes it very difficult to launch new military operations. It will be interesting to see what the government does. NEW DELHI –India responded cautiously Tuesday to an offer by a top Maoist guerrilla leader for a cease-fire and talks with the government, with the home minister saying he would wait for a formal proposal before considering the offer. Home Minister Palaniappan Chidambaram said he wanted a short, simple statement from the rebels without preconditions before responding to the offer by Kishenji, a senior Maoist leader in eastern India. On Monday, Kishenji told television channel NDTV in the eastern state of Orissa that “Our revolutionary violence will stay on hold for as long as state terror is put on hold.” If the government puts “violence on hold, not for 72 hours but for 72 days, then we will immediately stop our revolutionary violence,” Kishenji said. That would require the government to halt its Operation Green Hunt offensive – aimed at flushing the militants out of their forest hide-outs – from Thursday until May 7. These articles have been made available on Banned Thought. New Issue of CPI (Maoist) Information Bulletin and People’s March now Available! This article appeared in My Republica on February 18, 2010. In the article the government expresses concern that as much as 40% of the PLA soldiers are operating out of the cantonments where they have been stationed since the Comprehensive Peace Agreement was signed in 2006. KATHMANDU: United Nations Mission in Nepal (UNMIN) has refused to give details about former disqualified Maoist combatants who were discharge recently, questioning the use of such information. Chief of the United Nations Mission in Nepal (UNMIN) Karin Landgren conveyed her office´s reluctance to share the information with the government during her meeting with Chief Secretary Madhav Ghimire on Tuesday, said the Prime Minister´s Press Advisor, Bishnu Rijal. This article appeared on My Republica on February 20, 2010. 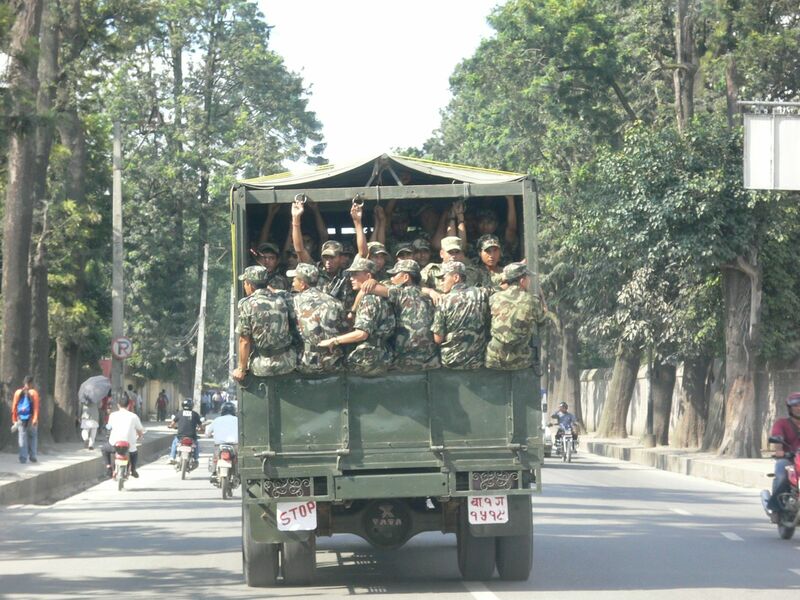 KASKI: Prime Minister Madhav Kumar Nepal today clarified that the government has not stopped the PLA combatants´ salary. Talking to journalists on Saturday afternoon while coming to attend the 7th Convocation of Pokhara University in Lekhnath municipality, PM said rumor on PLA´s salary halt was baseless. However, he said that reassessment on PLA´s salary distribution was required. Responding a question, PM said the Armed Police Force imported arms from India as per the government´s decision. He said APF and Nepal Police have right to bring in weapons for their skill promotion and trainings. He said he was committed to draft the constitution on time and added new statute would not de written until the existing deadlock ends. 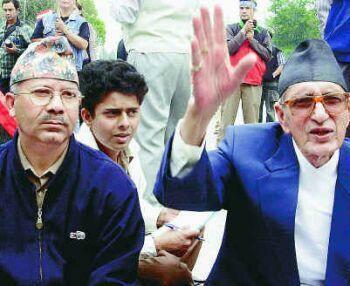 On the occasion, cadres of the Unified CPN (Maoist) had greeted the PM with the black flags. This article appeared in India Today on February 22, 2010. Operation Green Hunt, the joint anti-Maoist action, has failed to make a dent in the contiguous Maoist strongholds of East Singhbhum in Jharkhand and the Jangalmahal area of West Bengal. The Maoist cadres are having a free run in both the states, launching repeated attacks from the densely forested hilly region in the bordering areas. In the past 15 days, the Maoists have killed scores of policemen in both the states. The massacre at Shilda camp of the Eastern Frontier Rifles, in which 24 jawans were killed, was the biggest ever attack carried out by the Maoists in the region. In Jharkhand, they kidnapped a block development officer, who was released on Friday after the state government gave in to their demand and set free two jailed Maoist activists. This article appeared on Nepal News on February 20, 2010. The government has clarified that the two trucks that were obstructed by Maoist cadres at Naubise along the Prithvi Highway Saturday morning were carrying explosives, detonators and logistics for the Armed Police Force (APF), not arms as claimed by the Maoists. Remains of the day: Nothing is left of Madavi’s house at Gompad village in Chhattisgarh’s Dantewada district. 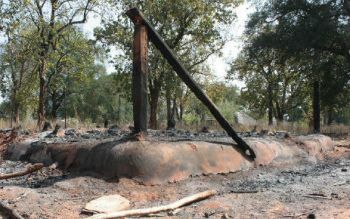 GOMPAD: A charred wooden stake and three graves are all that remain of the Madavi family in this remote village in Chhattisgarh’s Dantewada district. “Madavi Kanni was lying face down in front of the burnt house,” said an eyewitness. “She had been slashed with a sword and shot in the chest.” The bodies of her father, Madavi Bajar, her mother Madavi Subbhi and her 12-year-old sister Madavi Mutti, were found under a tree, 50 metres away. Even in the period of peace process, the Nepalese people are in the street for the protection of their civil rights, which is civilian supremacy. The feudalism has been beheaded and imperialism has been warned to hands off country by the justice loving people of Nepal. Still the remnants of feudalism and their imperialist allies are trying their best to strengthen anti-people alliance for the continuation of feudal-colonial exploitation over Nepal and Nepalese people. This article appeared in the Himalayan on February 13, 2010. 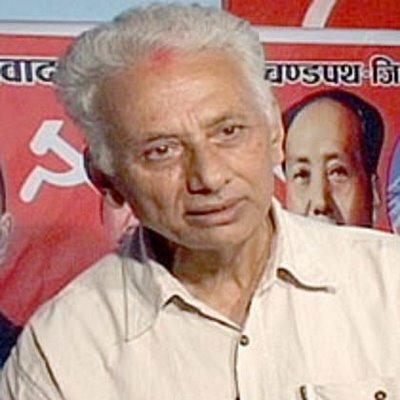 SINDHULIMADI: Unified CPN-Maoist secretary CP Gajurel today said his party would promulgate a people’s statute if the Constituent Assembly failed to do so by the May 28 deadline. Claiming that the people would revolt against the government, he said, “Our party will assist the revolt.” He further claimed that the remark of the president also showed that conspiracy was being hatched to obstruct the constitution drafting process. However, he maintained that the statute would not be written in favour of the people if his party did not get a chance to promulgate it. This article appeared in Red Star on February 18, 2010. The proletariat class, which is deprived of means of production, is forced to sell his labour as a commodity into the market to those bourgeois who grab them. In a capitalist society, those who produce commodity with the expense of their labour are deprived of appropriating the very product while those who are not at all involved in production appropriate it. It is not particular to a certain country but a universal phenomenon where the capitalist mode of production exists.